A new year has begun and I eagerly await my flying car while contemplating what new challenges this year will bring. Nobody could have anticipated that a new challenge to free speach would be issued so early in the new year. It caught plenty of people including myself, completely off guard. I have a special soft spot for France. For several years I called the suburbs of Paris my home. As it was with countless others, I was horrified to hear the news of the terrorist attack on the weekly Magazine, Charlie Hebdo on January 7. This incident is however far from the first time that France has had to deal with a terrorist threat. Long before the terrorist attacks in New York and Washington on 9/11, several bombs exploded in the metro and regional rail network of Paris. It was the year 1995 and it also happened to be around the time that I moved there as an 8 year old. Memories from this time are shady at best but I do remember all the public garbage cans being sealed to prevent potential evil doers from leaving bombs in the trash. The result was of course that garbage started to pile up around the garbage cans. One very vivid memory I have of that time however was the fear of going underground to the metro. I once cried and begged not to go down to the metro because I was scared that bad people where going to blow up me and my family. It’s hard to describe this fear today but thankfully have not experienced sheer terror quite like it since. When it comes to terrorist attacks, body count and number of injured always seem to grab the headlines but the psychological effect that they have on people is certainly more insidious. It should be considered prudent to think to use horrific events such as this to reflect on the state of affairs. Why did this happen? How should the world community respond? There are plenty of things to contemplate when it comes to terrorist attacks and answers are often hard to come by. This is without a doubt the greatest challenge that freedom of expression has faced since the small Danish newspaper, Jyllands Posten published cartoons depicting the Muslim prophet Muhammed back in 2004 and the resulting fallout that they caused. Those cartoons resulted in news outlets shamefully censoring themselves out of fear of violence, Danish embassies in several countries where attacked and perhaps most shameful of all was that several Islamic majority countries pushed for an anti-blasphemy resolution at the UN. The reaction to the Danish cartoons was a big blow for freedom of expression and too many people condemned the cartoons instead of condemning extremists who where threatening an old man with violence for the rather innocent act of drawing some rather distasteful cartoons. No matter how distasteful cartoons can be, no matter how much you can disagree with a cartoonist, there is nothing wrong with drawing an image of Muhammed in and of it self. 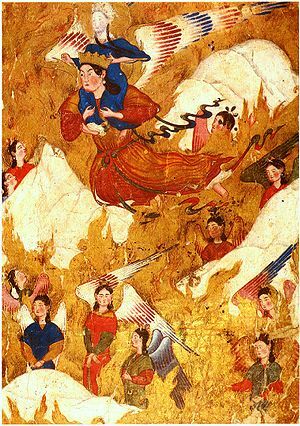 There are plenty of historic examples of Islamic art depicting Muhammed so it is needless to say that the prohibition on depicting Muhammed amongst Muslims is a recent one. So the right response to these attacks is not to start censoring images of Muhammed or playing the racism card for sharing Charlie Hebdo cartoons. The right response is not to call for the death penalty for Islamic extremists or to attack Muslims places of worship. The right response is not to say that the attackers where not real Muslims. It has been pretty well established that they where despite their insane interpretation of the Koran and to deny that is to ignore relevant facts. I would also like to remind the Icelandic police that the right response is not to arm our police, there is no reason to suspect that Islamic extremism is a problem here. The right response is not to blame western military campaigns in Islamic countries. There is a world of difference between a military campaign and terrorist attacks on innocent civilians. The right response is not increased internet censorship Last but not least this attack does not call for the increased surveillance of Muslims. In a recent interview, MP for the conservative Independence Party, Ásmundur Friðriksson made his contemptible ignorance known to the public. It must be noted that other MP’s and members of his party have been quick to condemn his comments. Ásmundur Friðriksson suggests that Iceland’s roughly 1500 Muslims should be investigated for cases of Islamic extremism despite the fact that Christian extremists probably outnumber all of Iceland’s Muslims. He however saw no reason to investigate Christian extremists and that people like Anders Behring Breivik have no supporters. Breivik has plenty of supporters and he apparently gets thousands of letters each month from nut-jobs all over the globe. Ásmundur’s ideas would only serve to isolate Muslims in Iceland. It should be in the interest of Icelanders to do the exact opposite and do everything in their power to make Muslims feel welcome in this country, that’s how you fight extremism. The correct response to atrocities such as those that happened in France is to expand freedom of speech. Extremists feed on socially isolated people and immigrants tend to be isolated in societies where they do not get good opportunities to adapt to their new society. It is also worthy to mention the fact that the majority of the victims of terrorism today are Muslims and it is rather sad to see that terrorist attacks in the West are required for people to realize what a threat extremists can be. If we want to combat extremism the best thing we can do is to let them speak their mind and confront their insane beliefs. The social isolation of immigrants must also be confronted to make it more difficult for extremists to lure them into insanity. A couple of suggestions I would put forward on how to respond to this tragedy in my own country can only be achieved by a broad consensus in our parliament, Alþingi. One would be to put an end to criminal prosecution for blasphemy. Yes you read that right, Iceland in 21. century still has a law criminalizing blasphemy. The second suggestion I have is to finish IMMI (The Icelandic Modern Media Initiative) which would make Iceland amongst the best countries in the world for freedom of expression. It would mean that we could have serious bragging rights on the international stage and lets face it, Icelanders love to brag. This is how we can show the international community how to respond correctly to terrorism and how to honor those who give their lives for freedom of expression. You may have heard the story of Iceland and the financial collapse the country endured back in 2008. You may also have heard stories about how the country did not resort to austerity measures, how we let the banks fail and jailed bankers. This is a story I hear again and again whenever I talk to people outside of Iceland and clearly detect the envy that that they feel towards my country. The envy however has been misplaced to a large degree. You see this so called “economic miracle” is just like any other miracle, it’s a big lie. It is perhaps the most successful PR con-job our nation has pulled and what makes it worse is that the international community has fallen for it. Nobody has been as helpful in perpetuating this lie as our president Ólafur Ragnar Grímsson, who regularly appears in international media and tells the world how Europe should follow Iceland by example. The truth of the matter is however that the Icelandic government took on a huge amount of extra debt after the collapse to keep privately owned banks afloat as well as the Icelandic Central Bank. The Icelandic government now pays an astronomically high amount in interest every year, enough to run some of the country’s largest institutions for a whole year. While austerity measures may not have been quite as backbreaking as in some EU countries, the devaluation of our currency combined with cuts in the public sector has made recovery from the collapse for the average citizen, a long and burdensome road. If you are a minimum wage worker, a student or unemployed then you most certainly have felt the burden of the financial collapse. The most insidious lie is probably the jailed bankers story. While there the office of the special prosecutor was created to bring the people responsible for the collapse to justice, an enormous sum of money has been spent on this office and very few bankers have been sentenced to serve actual jail time. There is however one clear example of this. Now you would think that a person who shares responsibility for the collapse of an entire county’s economy would deserve a pretty heavy punishment. The sentence was 9 months in prison…and of those 9 months, 6 months where on probation. Now you might wonder why it is important for people and governments in other countries to understand what truly happened in Iceland. Because many people want to do exactly what Iceland did. And then you can have populist parties promising you free money as well. Free money that as it turns out, just comes from your own pocket. We may have kicked out the politicians who got us into this mess, but the same people are back now, with the same backward policies that dragged our country to the cusp of financial ruin. The people who are paying for the mistakes of bad politicians and bad businessmen are normal, everyday people. There will be a next time, and it may very well come sooner than people think. Will we truly change things then? Or will we keep doing what we’ve always been doing and hope everything will be fine? Þetta reddast. Does government deserve compulsory respect? Governments are inherently weird. They often operate in ways that seam completely devoid of any logic or reason and are sometimes even draped in tradition and even in superstition. Nowhere is this more obvious to me than in my own country’s parliament called Alþingi. In parliament there are currently 6 different parties, The Independence Party, The Progressive Party, The Social Democratic Party, The Left-Green Party, The Bright Future and The Pirate Party. The conservative Independence Party and the populist Progressive Party form a majority coalition. Now the parliament has just reconvened after a summer vacation lasting approximately 3,5 months. During this time there is no way to start ask the ruling parties proper questions about how they are handling things while everybody goes on vacation. Now for the really weird part. According to tradition all members of parliament are supposed to march into church and attend mass before parliament reconvenes. Despite Iceland’s international reputation for being a liberal and tolerant country we have this very obvious form of injustice called a state church. Inevitably the politics of the church corrupt national politics and national politics corrupt the church. For the past few years this day has usually coincided with protests against the government but this year was relatively quiet. This may result in the ruling parties patting themselves on the back as they usually do. But how do you protest when you have no specific list of demands? That list would be too long to put down on a piece of paper. Now, in all this mess, some politicians claim that parliament should command respect from the public. No matter how disrespectful they might be behaving towards the public, they should still command compulsory respect. Now it may very well be that a governmental institution should be well respected, if it had earned said respect. Another weird tradition in parliament says that everybody shall wear suits, in fact you can be sent home of you show up wearing blue jeans. What is so disrespectful about blue jeans? Jeans in a certain way represent some of the greatest things about western democracy. They were a very expensive yet popular item on the black market in Soviet Russia. But more importantly Icelanders tend to preach “don’t judge a book by it’s cover” but at least as far as our parliament is concerned, the cover is certainly being judged. Compulsory respect has always struck me as a bit shady. Respect is and should be earned and should not be taken lightly. So how does a government regain the respect of it’s people? First and foremost the government needs to listen to it’s people. The problem is today that it has no proper means to listen in the way it needs to listen. While people may have learned plenty of lessons from the 2008 financial collapse in this country, very few politicians truly have. Now I recently became a quasi politician as I was offered to be The Pirate Party’s representative in Reykavík’s Council of Education and Youth. The mountain I have to climb to truly change things for the better is enormous. The fundamentals of politics in Iceland really have not changed one bit. The Pirate Party here may have gotten further than any Pirate Party in Europe but we none the less have a long road ahead of us. It would be nice to see politicians who act more like normal people. Wear clothes that don’t cost a few monthly wages for your normal low wage worker. Politicians who are willing to admit when they make mistakes, instead of repeating the same ones over and over again. Last but not least that when there is a series of protests outside the parliaments that get the attention of the whole world that they learn something from it. Seeing that my writing in Icelandic has been moved to another website and this one has been inactive for quite a while I will in the future be using it for my English speaking audience. Since I was a teenager I have been a big fan of heavy metal and I think I could be safely described as a true metalhead. It has been absolutely fascinating for me to watch the evolution of this music around the world. It’s a type of music that does not get a lot of airplay on the radio and some people simply describe it as noise. I became fascinated with heavy metal around the same time as the debate around illegal downloading and piracy started. I got introduced to Metallica just before they sued Napster for copyright infringement. At the time, Napster was the main place to download music online and it was amazing how easy and quick it was to get music from artists all around the globe. But at the same time I could understand and appreciate the artists point of view. I would have gladly paid for the music I was downloading but at the time there were no such services available. Not to mention that my local record stores had a very limited amount of the music I enjoy and it was way more expensive than the mainstream popular music. I had to order certain CD’s and some where just impossible to get a hold of. Thankfully, circumstances have changed dramatically from when I first started downloading mp3′s roughly 15 years ago. I have access to Spotify Premium and I can order almost any album I want of Amazon. I can even support bands directly by purchasing mp3′s, t-shirts and special editions of albums directly from certain bands. All this without the typical middleman that used to have a big say in what products where available to me. Thanks to the internet I have been introduced do metal bands from the Faroe Islands, Brazil, Israel, India, Japan and China just to name a few examples. I consider myself very fortunate compared to a lot of heavy metal fans abroad. Fans in Iran, Saudi Arabia and other authoritarian countries only have access to heavy metal through piracy and the smuggling of albums. But unlike in countries with authoritarian regimes, the main reason it seams to be fine to violate people’s basic human rights in the western world is copyright infringement. Internet censorship in western countries is mainly limited to websites like thepiratebay.org. Now there is no real debate that copyright infringement does happen through services like The Pirate Bay but there is also plenty of perfectly legal non-copyrighted material being shared there. Why should The Pirate Bay and sites like it be singled out, either all sites that facilitate copyright infringement should be censored or none of them should. By that logic Google and Dropbox are just two examples of billion dollar companies that should be censored for facilitating copyright infringement. You need only type in the word “torrent” along with the title of a movie on Google to find a link to download a movie for free. So what are the real world consequences of going after The Pirate Bay and not Google? One of them is that net neutrality faces a serious threat from certain companies that would benefit from internet slow lanes. A large proportion of internet traffic today goes through peer to peer networks, which is one of the main ways that people use to share files. Among those files is of course copyrighted material. The traffic through these services is so heavy that some regulators want to allow ISP’s to decide how much bandwidth is allowed to go through for example The Pirate Bay or Youtube. It means that big ISP’s will decide for you weather the speed of your internet is used for VOD or Youtube. The consequences of changing the rules on net neutrality will be that the internet will start looking and feeling a lot more like radio or television. All the small things we have come to know and love about the internet will slowly disappear. Your favorite Youtube channel will cease to exist and before you know it, companies will start a bidding war for more bandwidth. I haven’t heard much heavy metal in the radio or on television recently and that is why I prefer the current model of the internet, with all the diversity and enjoyment it has to offer. Það hefur verið nokkuð áhugavert að fylgjast með ríkisstjórninni ræða um samningaviðræður Íslands við Evrópusambandið undanfarna daga. Sigmundur Davíð sakaði Samfylkinguna um að beita mælskubrögðum í anda Morfís í ræðu á Alþingi nýlega sem vakti upp hlátur nokkurra þingmanna. Vigdís Hauksdóttir hélt til að mynda því fram að Malta væri ekki sjálfstætt ríki. Það sem vakti mestu athygli var þó kannski sú staðreynd að Sjálfstæðisflokkurinn fjarlægði loforð um þjóðaratkvæðagreiðslu um áframhaldandi viðræður við ESB á heimasíðu sjálfstæðisflokksins. Þetta minnti óþægilega mikið á svipað atvik sem átti sér stað í júní á síðasta ári. Það varð að nokkuð stórri frétt þegar loforð um aukna vernd fyrir uppljóstrara hvarf af einni kosningasíðu Barrack Obama Bandaríkjaforseta. Barrack Obama og Sjálfstæðisflokkurinn virðast hafa þá hugmynd að þeir geti breytt sögunni með því að eyða loforðum af kosingasíðum sínum. Það væri hægðarleikur að kalla þetta „ritskoðun á sögunni“ rétt eins og í skáldsögum á borð við 1984 en þökk sé internetinu er slíkt ekki hægt. Þetta er afritað víðsvegar um netið og fólk er ekkert að fara að gleyma slíkum kosningasvikum auðveldlega. Óháð allri umræðu um inngöngu Íslands í Evrópusambandið gæti þetta haft alvarlegar afleiðingar fyrir alþjóðasamskipti Íslands. Hvernig lítur það út þegar við reynum að semja við önnur lönd eða önnur alþjóðasamtök ef að Ísland getur verið líklegt til að hætta skyndilega við í miðju samningaferli? Það er ekki of stórt stökk að álykta að það verði litið á Ísland með ákveðinni tortryggni þegar við reynum að fara í alþjóðasamninga aftur, hvað þá samninga sem krefjast þess að Ísland eða erlendir aðilar eyði tíma og fjármagni í að gera þá að veruleika. Svo það sé alveg á hreinu hef ég lengi haft mínar efasemdir um Evrópusambandið en það er þegar búið að ausa milljöðrum í verkefnið og það væri fáránlegt að henda því fjármagni í ruslið án þess að fá fullunninn samning í hendurnar svo að hægt sé að taka upplýsta ákvörðun með eða á móti honum. Umtalsverður misskilningur virðist ríkja um höfundarréttarstefnu Pírata, en þegar Píratar kalla eftir endurskoðun á höfundarrétti, þá óska þeir eftir styttum dreifirétti —og frjálsri dreifingu á efni, sé dreifingin ekki í ágóðaskyni. Það eru ekki mörg samfélög sem hafa dafnað þar sem er í lagi að stela og Píratar vilja alls ekki stuðla að slíku. Frjáls dreifing á efni sem er ekki í ágóðaskyni. 20 ár á efni sem er í ágóðaskyni. Skráning eftir 5 ár til að nýta 20 ára rétt í ágoðaskyni að fullu. Betri skilgreining á sanngjarnri notkun efnis. Ríkisvaldið skuli ekki hafa höfundarrétt á sínu efni. Höfundarréttur hefur ekki fylgt þeirri tækniþróun sem hefur átt sér stað undanfarin ár og hefur það haft mjög heftandi áhrif á þróun internetsins sérstaklega. Stóra áskorunin sem internetið mun þurfa að glíma við árið 2014 er þrívíddarprentun. 3D prentun er ekki lengur bundin við litla og krúttlega plasthluti (sjá dæmi fyrir neðan, meðal annars bíla, hljóðfæri, hús, líkamsparta og jafnvel hluti í herþotur). Hefðbundin höfundarréttur gerði engan veginn ráð fyrir því að hægt væri að prenta nýjustu hönnun sem var að koma í búðirnar. Þessi tækni bíður upp á margvíslega möguleika hvað varðar framleiðslu á vörum. Því væri synd að leyfa einhverju á borð við úrelta mynd af höfundarrétt að hefta þá þróun. Þrívíddarprentun bíður upp á það stórar breytingar í framleiðslu á vörum að horfa verður aftur til iðnbyltingarinnar til þess að finna jafn áhrifamiklar breytingar í framleiðslu. Það er rétt hægt að ímynda sér hvað það munar miklu að þurfa ekki lengur að flytja heilu vörurnar milli landa og þess í stað flytja aðeins hráefnin sem notuð eru í vöruna og svo skjal í tölvu um hvernig skal prenta vöruna út. Sparnaðurinn sem þessi tækni mun skila sér er rosalegur. Minni þörf verður fyrir flutningi á vörum milli landa sem mun spara gríðarlega mikla orku. Ég bíð því spenntur eftir að sjá hvernig þróunin í þessari tækni verður og hvað verður svo Spotify eða Amazon þrívíddar prentunar.